I have had some people in the USA interested in these locks. Nobody wants there sliding patio door getting easily lifted out of the frame from the outside and opened by burglars.. 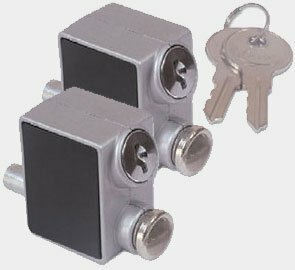 These locks come in pairs and each pair is keyed alike, one key will open both. They are available in white and gray, normally the are fitted in the top and bottom corners of the non-locking side of an external sliding patio door. Should you wish to increase the security further on your patio door you could fit two more of these locks on the locking side of the door. The locks are screwed to the frame, right on the corner for support, and the bolts are pushed into the door in pre-bored holes of the correct size. The door is thus locked in place and cannot be lifted. Check out out web site www.emhardware.ie or call me on 021 488 3131 for more advice on fitting and to place your order. Labels: Extra security for your patio doors. Lock to stop the patio door getting lifted open. Push in bolt secondary door locks. I just got a email requesting me to sell a Weiser locking front door knob from a guy in Australia. At first I did not realise where he was in the world I answered with advice and information on the problem. I got an answer back asking me would I send a lock to Australia, and I said sure I would. It appears there are so may Irish people in Australia now that someone from here advised that his broken lock was available from myself in Ireland. Small world!!! Keep the referrals coming. 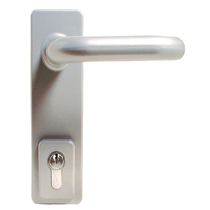 Here is an example to a top of the class inquiry (genuine from today), all the relevant information is given and it is very easy for me to tell the person that we stock this handle in white, chrome and gold colours and we can dispatch it without delay. For others please take note of the measurements, the key ones being the distance between the centres (A), and the distance between the screws (B). 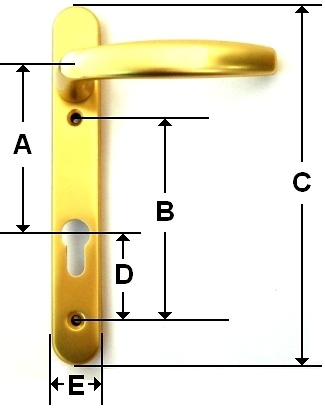 I will know most of these measurements for most of the available handles from memory, but I will need them from you to supply you with the correct replacement handle. 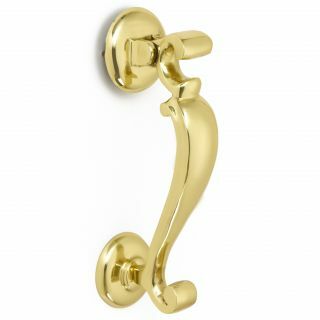 I stock and sell all these type of handles, I can advise you on installation as well. I would appreciate if you could let me know if you have this in stock and if so price. If you don't have this in stock can you let me know if you can order it in. For your front door why not choose from the best in door knockers, that combine classical design with smooth modern lines. Match all your door fittings from the same manufacturer and with the style of your front door; you will then have a special looking house. We offer you the best from international manufacturers who are as likely to be designing bespoke fittings for mansions and palaces as the fittings for your house. Please have a look at our web-site www.handlesupplies.ie and find a full range of front door fitting to suit all manner of architectural design. Let our experience of dealing with the best manufacturers in the world of door fittings help you quickly find what you're looking for. Call 021 4883131 or email john@emhardware.ie and we will open all the doors to all the world of the finest door fittings. What we cant supply immediately form our warehouse store we will quickly supply to order. Left is a center door knob finished in smooth clean lines that match the doctors knocker style above. 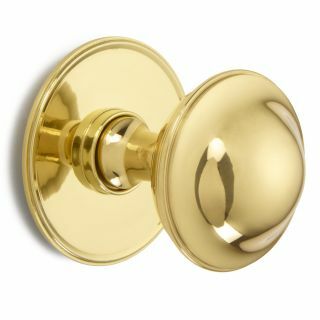 Here the centre door knob and knocker are in polished brass, they are also available in brushed steel (satin chrome), polished chrome, bronze, and up to twelve other other finishes such as antique brass and old world antique silver. 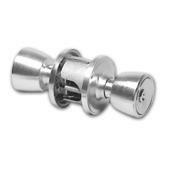 Please have a look at our web site for more options on door knobs and knockers, since these are premium products, they will not appear on the shelves of regular stores or even DIY chain stores. You need to come to our store or contact us to get easy access to these special products, reserved for elite customers with inside knowledge up until now. 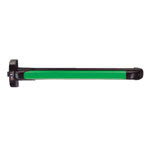 Often I am asked 'is there some way an emergency door with the standard grey push bar type of panic exit door lock and vertical rods, can be made work as a regular door that will open and close easily. The answer is simple and provided below. 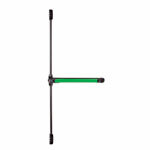 For emergency exit doors with rudimentary grey rods closing at the top and bottom of the door, regular use as a normal latching door is not really possible. This is because the bars that hold the door closed do not spring back and allow the door to swing closed and and latch in the closed position. The common scenario where you need to use a door fitted with an emergency exit panic bolt for regular access to your building is easily remedied. This is made possible by the use of a touch bar panic bolt and a lever action outside access handle. 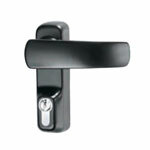 The outside access handle will operate as a normal lever handle to open the door, when it is unlocked. The touch bar panic latch will allow the door close smoothly and remain closed with the minimum of effort. From inside the door is opened by pushing the touch bar, an action even the public can be instructed to do as a 'Push Bar to Open' sign is placed just over the touch bar. For single doors you can use a touch bar panic latch, which latches at the center point only and is used with the lever action outside access handle, the same as with the latch action panic bolts above right. Iseo products are shown above these are the considered one the the best available, Exidor products are shown below. All these panic door fittings perform perfectly as emergency door exit locks but they have the added advantages outlined above.